Here are a few observations about the movie and about New York history. The history as presented in the film is of course sensationalized, gory, and salacious — partly because it was made that way for the silver screen, but also because its source, the book Gangs of New York by Herbert Asbury, is itself scandalous and violent. Still, the film offers a useful window into some important themes. 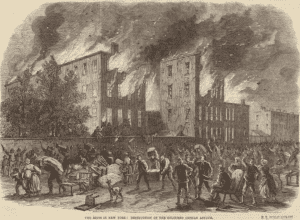 For example, the rival mobs of volunteer fire companies battling in the streets as a house burns to the ground is not beyond the realm of possibility; indeed there were heated competitions among these organizations, sometimes exacerbated by the potential of insurance bonuses to fire companies. The setting also provides insight into the squalid conditions of immigrant housing in the mid-nineteenth century. The film’s rendering of the Five Points, an infamous enclave of impoverished Irish immigrants on New York’s Lower East Side, is quite powerful, and furnishes some useful nuances. For example: When Charles Dickens visited New York City in 1842 he commented on the squalor of the Five Points and noted the pigs roaming the streets; the pigs are included in Scorsese’s rendering, too. Indeed, in the movie it is interesting to note the pigs and ragged dogs wandering the streets of the impoverished immigrant neighborhood, while in a later scene we see well-groomed purebreds being led along fashionable uptown avenues. American cities were ill-prepared for the dramatic influx of population that came with the arrival of immigrants, so ad hoc housing was improvised or old structures were divided by unscrupulous landlords seeking to squeeze every last dime out of their holdings as well as their tenants. For example, a former brewery built in 1792 was transformed into a dwelling in 1837 to accommodate some of the Five Points’ growing population of working-class Irish, German, and African-Americans. This wretched dormitory was known then as “The Old Brewery.” Asbury notes that its yellow paint had long peeled, “so that it came to resemble nothing so much as a giant toad, with dirty, leprous warts, squatting happily in the filth and squalor of the Points.” The Brewery’s cellars, which once housed machinery, now were divided into lodgings; more rooms were above ground. At its height this single dilapidated building was said to have housed a thousand people. Asbury claimed that the Old Brewery averaged a murder a night for 15 years, and nearby tenements maintained a similar pace. Whether or not we believe such a remarkable claim, the film does reveal the ramshackle, sometimes violent world in gruesome detail. Meanwhile, there were figures who were offended by such chaos and sought to impose order. 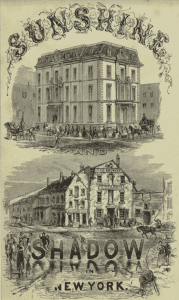 The Old Brewery was purchased by reformers in 1852 and demolished. The movie depicts one of the so-called “slumming” expeditions in nineteenth-century New York, in which reform-minded aristocrats would take field trips to observe life among the lower classes. Long before these became popular, the Protestant revivalism of the Second Great Awakening helped fire reformist enthusiasm. For example, immigrants arriving in New York City in this period were given bibles by agents of the American Bible Society — established in 1816. By 1849, the Society had distributed 6 million. Similarly, in the 1840s Methodist women working through the New York Ladies’ Home Missionary Society entered the Five Points, railing against liquor and Catholicism. Another approach was the creation in the 1850s of the Five Points House of Industry, part of the Antebellum reformers’ institutional impulse. Such institutions, including Houses of Industry, Protestant-run Sunday Schools, Houses of Refuge, and the like, took in youths (usually lower-class, new-stock Catholics) and sought to teach work skills and inculcate useful values — like deference to one’s social “betters,” orderliness, and a general “Americanization.” In the film, Amsterdam Vallon was sent to such an institution. Mostly, native reformers viewed and described the Five Points and similar immigrant enclaves in the same stark, damning terms as Asbury, and with the same gritty, horrifying drama that appears in Scorsese’s film. Of course there was more to this world, especially from the perspective of the immigrants themselves — the reformers could not save, nor did they observe, everybody. The film invokes quite powerfully the recreational life of the Five Points and of the working-class city more broadly, and that very much included rum-shops and saloons. Such institutions were seats of power for local figures, and they are well-represented in the film. Moreover, the film rightly reveals the ubiquity of prostitution in nineteenth century New York. On the other hand, the movie incorrectly depicts a vibrant Chinatown in New York City in the years of the Civil War. While there was a Chinese population in the city at that time, it was miniscule. The Chinatown we see in the movie was a late-nineteenth century New York phenomenon. Another key theme in American history very much at the heart of the movie is Nativism. The obscene, bigoted rantings of “Bill the Butcher” might seem exaggerated, but in fact they capture an important current in American society and politics in the mid-nineteenth century that often boiled to the surface — whether through nativist riots or the rise of the Know Nothings and the American Party in the 1850s. One way to settle such scores was ethnic violence — the core of the film’s plot. Another, also depicted with verve in the movie, was through the vibrant politics of the era. Universal white manhood suffrage had been established in the Jacksonian Era, and with Protestant reformers and nativists tending to favor the Whig Party, immigrants in New York City flocked to the Democrats. 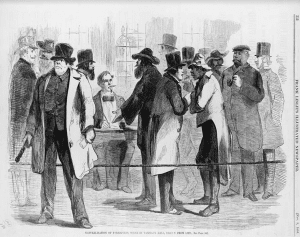 The Society of St. Tammany (Tammany Hall), a Democratic club that would soon become the Democratic organization for Manhattan, came of age in these decades. Tammany agents helped immigrants fill out naturalization papers and helped them register to vote. Meanwhile, as generations of scholars have shown, the political machine sometimes stuffed ballot boxes and engaged in mass-bribery (depicted in the movie). They also helped to humanize the American democracy and connected immigrants with social and political power. Some scholars have noted that Tammany became increasingly aware of the need to provide services for the immigrant population after the mayhem of the New York City Draft Riots of 1863, and this Tammany epiphany, as well as the riots, is also depicted in the film. In some ways, the movie underplays (although does not completely ignore) the racial tensions of those times. As one of my colleagues has noted, it is unlikely that Amsterdam’s close friend would have been black, although not impossible, since as Asbury notes black and Irish New Yorkers were often crammed together in the Five Points. Nevertheless, the Draft Riots of 1863 had much darker elements than shown in the movie. It did start based on class antagonisms, as noted in the film: poor, largely Irish workers began a protest against the Union Army draft, frustrated that wealthier citizens could pay to keep out of the army and that therefore disproportionate numbers of working-class Irish were being pressed into military service. But the protests that began on July 13 swiftly descended into rioting; political speech turned into a bacchanalia of destruction and violence (all depicted to sometimes appalling and sometimes amusing effect in the film). Eventually the whole episode warped into a race riot, with attacks on the homes and institutions of abolitionists and African Americans. Estimated death tolls vary; but in the end hundreds of black New Yorkers were displaced, dozens were killed, and at least eleven were lynched. On July 16, it took five army regiments that had just returned from Gettysburg to put down the surly mobs and end the pandemonium — although the scene in which troops arrive and appear to massacre hundreds of working-class protesters near the end of the film seems a bit sensationalized. Still, this episode did get the attention of politicians in the city, including Tammany Boss William M. Tweed. Boss Tweed, whose organization increasingly recognized the importance of the immigrant vote — especially the Irish, also recognized that the draft riots were not some act of peculiarly Celtic barbarism, which is how many nativists saw it. Tweed understood that this was an outburst of terrible violence by a group of people who had actual problems, needs, motivations: they were ostracized socially, they were deprived economically, and they had emerged as a sort of permanent underclass. And so to them, the class bias of the draft was the last straw; the destruction of property and the terrible racial violence of 1863 were an explosion of frustration from the immigrants’ point of view — and this is shown in the film. For his part, Tweed used this opportunity to strengthen Tammany’s hold on New York politics and bring a semblance of order to the city. 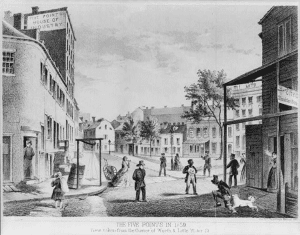 Tammany promoted a scheme to create a fund to pay for poor New Yorkers’ exemptions; they worked with the Lincoln administration to reduce New York City’s draft quota; they participated in running the draft to promote a sense of just administration; and more generally, Tammany continued to provide much-needed relief to the Irish and other working-class immigrants. The other element in the movie that bears mentioning briefly is the religious question. The film provides an important view of the vicious anti-Catholic bigotry of mid-nineteenth century America, and shows how this was often inextricably linked to broader nativist themes. There are also flashes of insight into the profound importance of the Catholic Church for Irish Americans. Many contemporary Irish Catholic figures were aghast by the raw world that the portrays, and there was a drive by high clergy for a more refined Irish America. This would be centered on the Church, but it would also mean less alcohol, less violence, less chaos. The great institution-builder in the American Catholic Church at that time, New York Archbishop “Dagger John” Hughes, himself an Irish immigrant, helped guide this transformation, and his last public appearance was a speech given on July 17, 1863, in an attempt to calm down the rioters. This is hardly an exhaustive analysis. However, it does point to some of the key themes in New York history that feature prominently in the movie. Hopefully, this brief consideration can serve as a starting point for conversations about a film with enduring popularity. Photos, from above: D.T. Valentine’s Manual, “The Five Points in 1859,” 1860 (Library of Congress); “Sunshine and Shadow in New York”: the “Five Points Mission of the Ladies Home Miss. Soc.” vs. the “Old Brewery,” 1873 (New York Public Library); “The riots in New York: destruction of the coloured orphan asylum,” Illustrated London News, 1863 (New York Public Library); and “Naturalization of Foreigners, Scene in Tammany Hall,” Frank Leslie’s Illustrated Newspaper, November 8, 1856 (Library of Congress). §Herbert Asbury, The Gangs of New York: An Informal History of the Underworld (New York: Vintage, 2008), along with Russell Shorto’s introduction to ibid. §Iver Bernstein, The New York City Draft Riots: Their Significance for American Society and Politics in the Age of the Civil War (New York: Oxford, 1990). §Paul Boyer, Urban Masses and Moral Order in America, 1820-1920 (Cambridge, Mass. : Harvard, 1978). §James J. Connolly, An Elusive Unity: Urban Democracy and Machine Politics in Industrializing America (Ithaca, N.Y.: Cornell, 2010). §Roger Daniels, Coming to America: A History of Immigration and Ethnicity in American Life (New York: Harper, 2002). §Robert Fitts, “The Rhetoric of Reform: The Five Points Missions and the Cult of Domesticity,” Historical Archaeology 35:3 (2001): 115-132. §Terry Golway, Machine Made: Tammany Hall and the Creation of Modern American Politics (New York: Liveright, 2014). §Oscar Handlin, The Uprooted: The Epic Story of the Great Migrations that made the American People (Boston: Little, Brown, and Co., 1952). §Leslie M. Harris, In the Shadow of Slavery: African Americans in New York City, 1826-1863 (Chicago: University of Chicago, 2002). §Daniel Walker Howe, What Hath God Wrought: The Transformation of America, 1815-1848 (New York: Oxford, 2007). §Jackson Landers, “In the Early 19th Century, Firefighters fought Fires . . . And Each Other,” Smithsonian.com, (2016). §John Loughery, Dagger John: Archbishop John Hughes and the Making of Irish America (Ithaca, N.Y.: Cornell, 2018). §Robert Weible, Jennifer A. Lemak, and Aaron Noble, An Irrepressible Conflict: The Empire State in the Civil War (Albany, N.Y.: SUNY Press, 2014). Robert, thanks a bunch for your exhaustive, informative and well-written piece. I’m currently working on a couple of New York gang history and/or fiction projects myself, though focused on the late 1950s and early ’60s (which Scorsese also famously covered with “Goodfellas”… though my work is focused more on the entertainment industry). So your themes above are helpful (such as the intractable anti-Catholic sentiment that almost kept Kennedy out of the Presidency, or the Tammany types in NY, Chicago and Boston that sort of put him over the top). I’m still looking for collaborators, such as potential panelists or discussions of crime, social reformers, and social justice/civil rights warriors from within popular entertainment, and/or the mobsters, businessmen and politicians who stood in their way. If I lived closer to NYC (I’m near Chicago), I’d take a class with you, or grab a beer. In any case, thanks again, keep up the great work, and maybe we’ll hear from each other again sometime. You can contact me there if you’re interested, or at mnielsen34 (at) gmail (dot) com. Especially if you have some more modern historical research to recommend on this subject, I’m all ears.